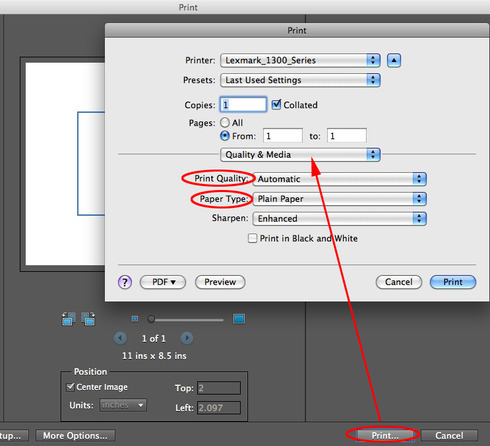 Photoshop Elements: How to change printer specific settings? I have just converted from a pc to IMac OS Lion and from Elements 6 to 9. I eventually managed to transfer my ICC profiles but cannot find the "Advanced Settings" menu so unable to set paper type, quality etc. Prints are totally useless. Still getting used to the Mac? Unlike Windows, there is no "Advanced Settings" button. Brett, Thanks for the response. As you say still getting used to the Mac. I have an Epson Photo R2400 printer and use Fotospeed paper and continuous Inkflow system. They supply the ICC profiles. The middle drop down menu has the following options: Paper Handling, Cover Page, Print Settings, Page Layout settings, Paper configuration, & Supply Levels. Print settings seems to be the most relevant but won't let me do what I want. It has Basic/Advanced Colour Settings. Under Basic you have Page Set Up which is fixed as standard. Media Type which is either Plain Paper or the Preset Epson papers. Colour which is greyed out. Colour Settings - Off and greyed out. Print Quality - economy, fine, photo, best photo & photo RPM. High Speed, Mirror Image & Finest detail. Advanced Colour Settings don't let you do anything. I cannot find any way of inserting paper type, dpi, quality etc. or using the ICC profiles. It's me again. Can anyone help me with this problem? I am a keen photographer and member of a photographic club and have not been able to print a picture since getting an IMac and Elements 9. I have had to miss entering a number of competitions and it is very frustrating and annoying. Unfortunately, we can't help you with these settings. They are generated by your printer's driver. If you were to hook up a different printer you would see different options. Perhaps even see different categories. We don't control anything that appears in this dialog window. Nor will modifying any settings in our application make a change to what options you have available or grayed out. This really is annoying. Buying Elements 9 was a complete waste of money because I can't print acceptable photos. If I lashed out on CS5 would I be able to do what I want or would that be another and even more expensive waste of money? Again, the problems you are facing are not caused by Adobe. If you were to buy Photoshop CS5, you would see the same thing once you are dealing with the printer specific settings. Or print from Microsoft Word, or Apple Safari, or any other software you choose to print from. That the problem is not Adobe's does not make complete sense. I can print the same photo to the same printer from Word. What should I be doing in PSE 9 or not doing that is causing the problem IN PSE 9? I agree with Mark. Epson tried to help but in the end they said "Epson printers on a macintosh do not have driver settings, this is all controlled within the program you are printing from. If the previous email, has not been of assistance, you will need to speak to Adobe again regarding this matter as Epson cannot support Photoshop queries." It still appears that the problem is with Adobe and having used their programmes for many years I am very disappointed in their response. It seems everyone other than Adobe thinks it is their problem.